Filling stations, as they were once popularly called, are something we take for granted today. There is no shortage of places to refuel when we head out on a road trip. And, to make things even better, gas stations have evolved into a convenience store and fast food hybrid. We can now fuel up in every sense of the word. Things were not always so easy for road trippers. 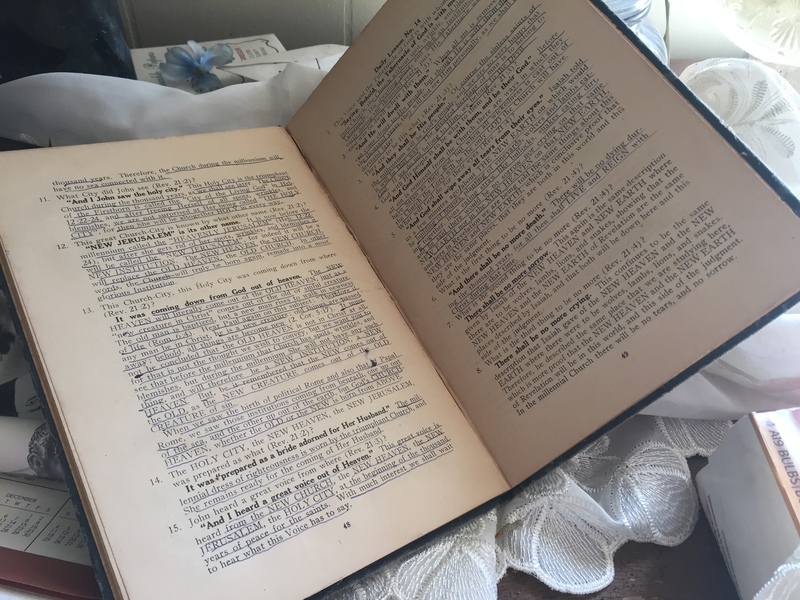 I recently listened to an audio cassette recording of my grandfather describing a road trip he took in 1917 from San Diego in Duval County all the way to California. “In those days,” he said, “the roads were almost impossible. There were no paved roads. It was a hard trip.” But, he made it. I definitely inherited my grandfather’s yearning for the open road. As much as I enjoy my travels around the world, there is nothing quite like getting behind the wheel of my pick-up truck and exploring Texas highways and byways. I love the fact that I can drive all day and still find myself under the vast Texas sky. And, of course, I have seemingly endless options of places to stop and refuel. 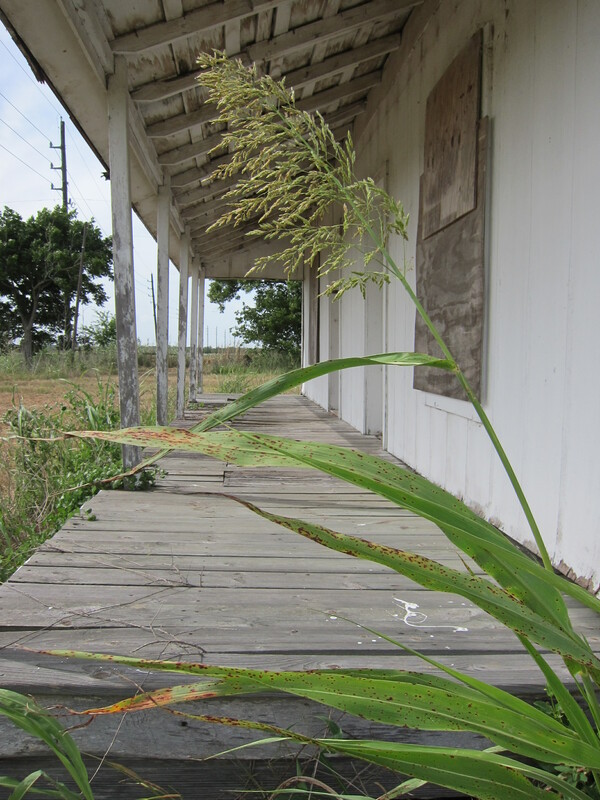 As I venture down Texas roads, I always keep an eye open for abandoned places. These idle and lonely structures draw me in and stir my imagination. 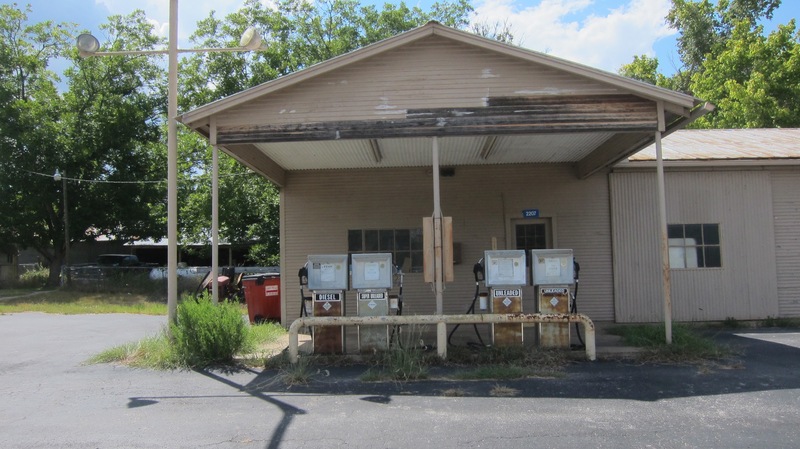 I am especially fascinated by abandoned filling stations, the places where the generation of road trippers before me stopped for fuel and refreshment, perhaps an ice-cold Coca-Cola and a Moon Pie. 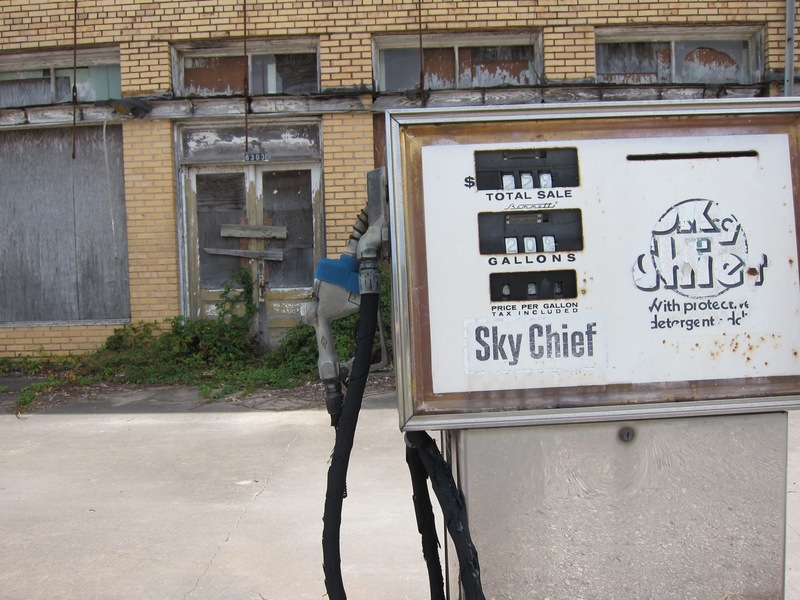 Some of the abandoned filling stations I have come across are from the days of full-service — when someone actually pumped the gas for you and even cleaned the bugs off the windshield. I started driving in the days before self-service pumps. The lowest I ever paid for a gallon of gas in those days was eighteen cents. And I bought more than my share of Cokes at filling stations. 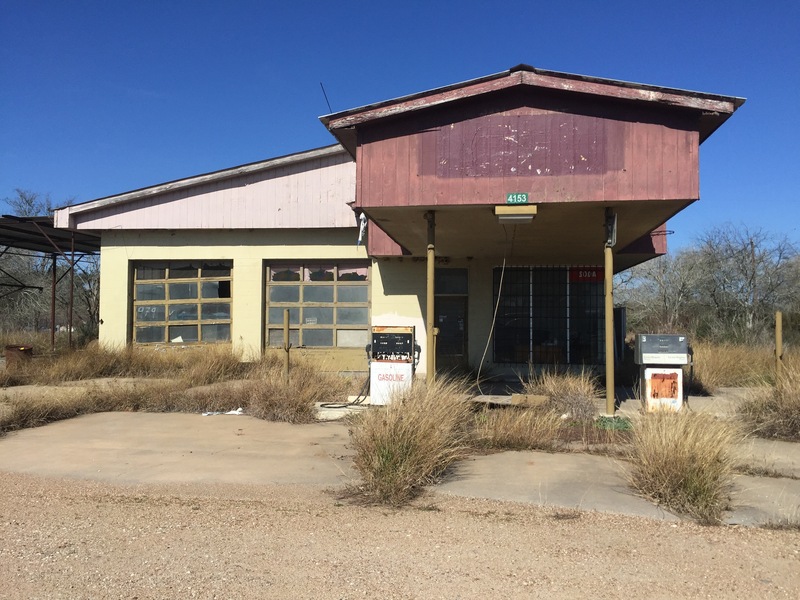 The old abandoned filling stations on remote stretches of highways remain as mute testimony to our restlessness and yearning to explore the places near and far from us. 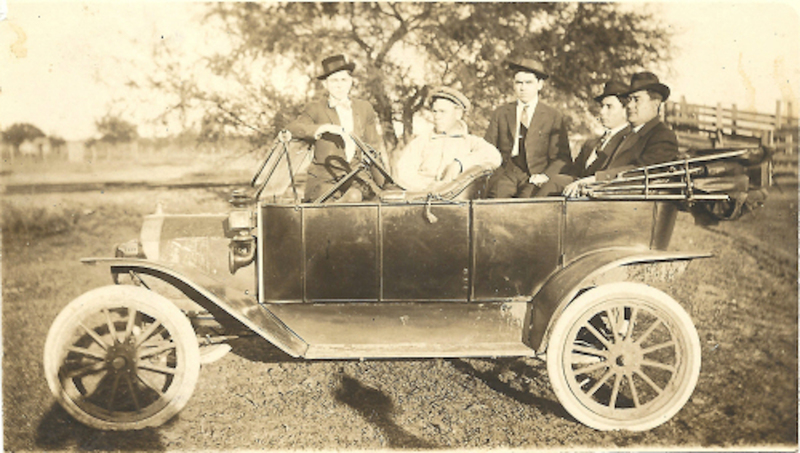 They made it possible for the previous generation of road trippers to see and explore more of the Lone Star State and places beyond. 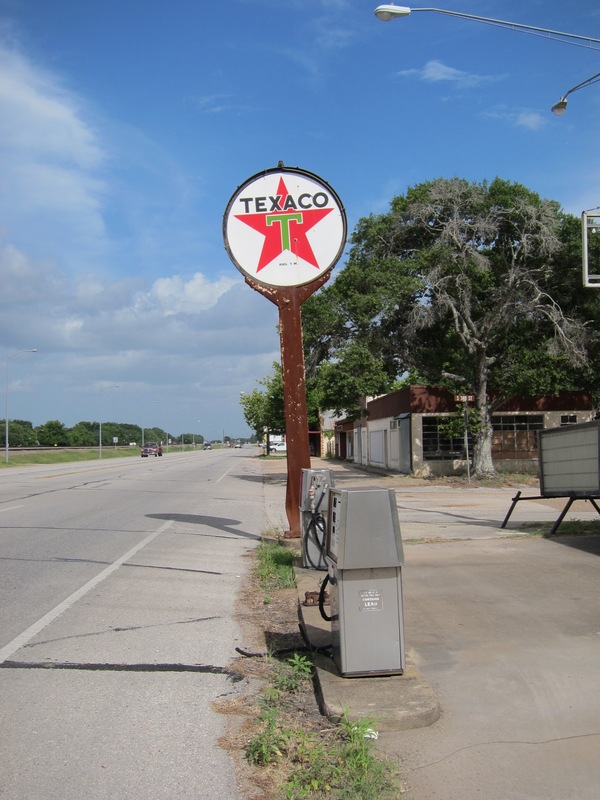 The next time you are on the road, take a moment to reflect on the role of the filling station. We are certainly fortunate to live in a day when we can travel as far as we like — and, on well-maintained roads. But, were it not for the humble filling station, we really would not get very far at all. They are indeed an oasis for road trippers. In the closing sequence of “The Wizard of Oz,” young Dorothy, who is longing to return to her home in Kansas, speaks one of the most memorable lines in the story — “There’s no place like home!” Dorothy’s words are true. There is no place like home. Just the mention of the word home does something good to our hearts, especially when we’ve been away for any period of time. 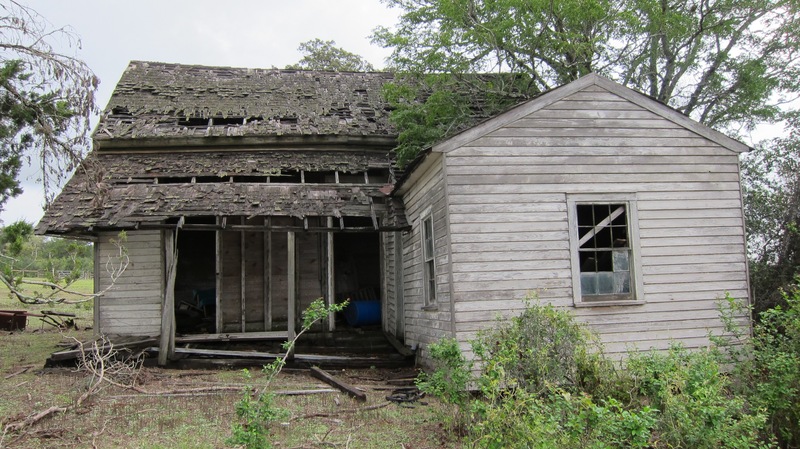 One of the best things about backroads adventuring in the Lone Star State is coming across old homes — long abandoned structures weakened and worn by the passage of time. 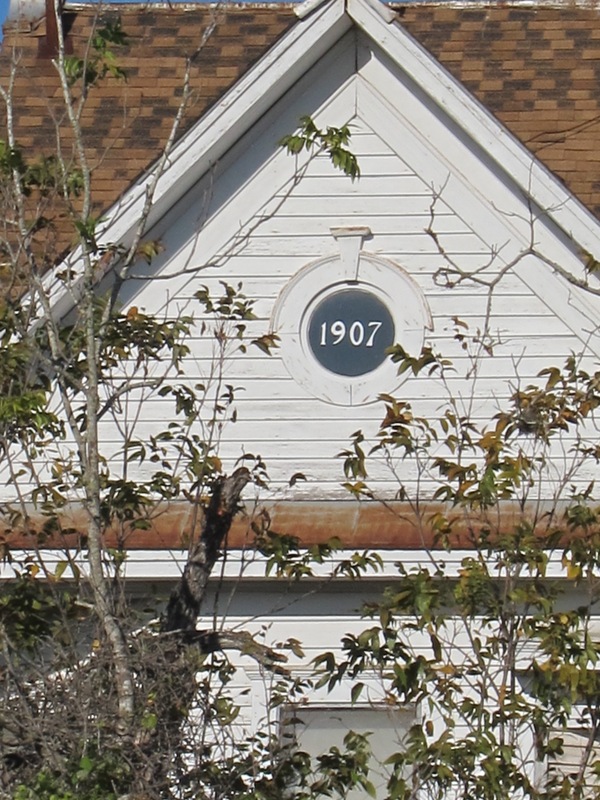 You won’t find these crumbling old places in our manicured HOA-governed subdivisions. You’ve got to hit the backroads and do some exploring. Whenever possible, I have to stop to explore these fascinating places once held dear by occupants unknown to me but not unlike me. Every decaying structure stirs my imagination and causes me to ask questions only walls could answer. How I’ve often wished walls could talk! 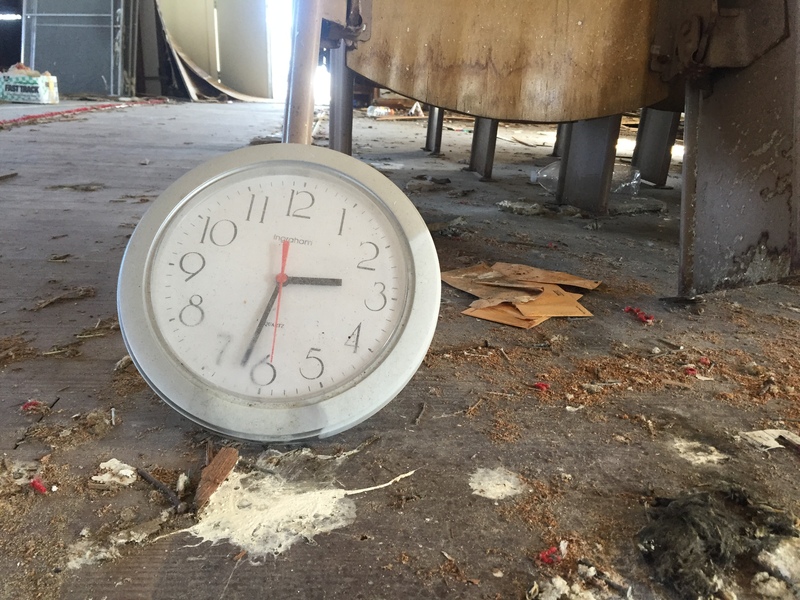 Each and every abandoned home share one thing in common — at one time they were all new. These old homes represent the dreams, aspirations, and perhaps the answer to the prayers of whoever built and lived in them. Someone was excited to see the walls go up and the roof take shape. Someone was the first to step across the threshold and the last to move away for good. Who looked forward to returning to these places, perhaps to be greeted by the welcoming embrace of a loved one? Who sat on the front porch watching a sunrise or sunset or the falling rain? Who carved the turkey at Thanksgiving or put the gifts under the Christmas tree? Who anxiously looked out a window, awaiting word about the welfare of a loved who was away? Who repaired the leak in the roof or the loose floorboards? These old homes are the context in which people celebrated life’s ordinary days and holidays. And yet, at some point, the life and laughter moved out and silence moved in. Those connected to these old properties are the remaining custodians of their history. And, unless this history is recorded or passed on, it too will go the way of these old homes. There is indeed no place like home. 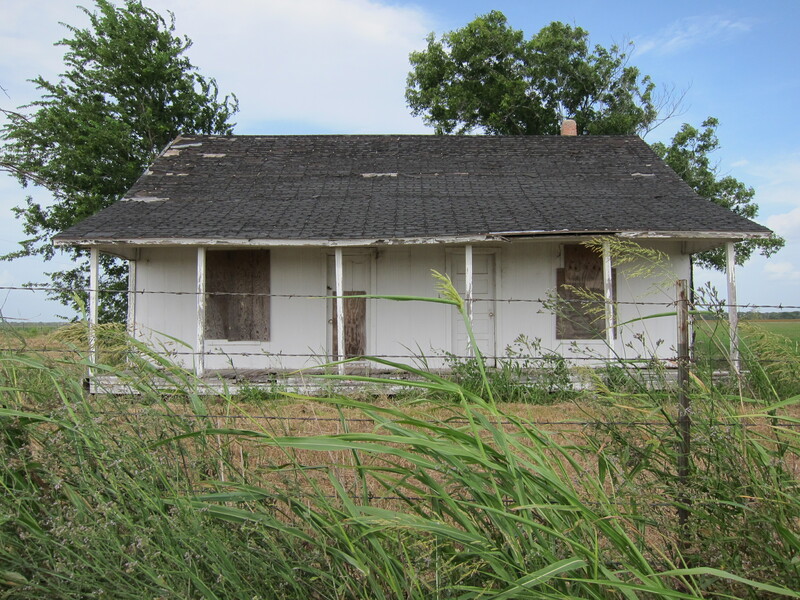 And the fascinating old and abandoned homes on Texas backroads are definitely worth exploring. 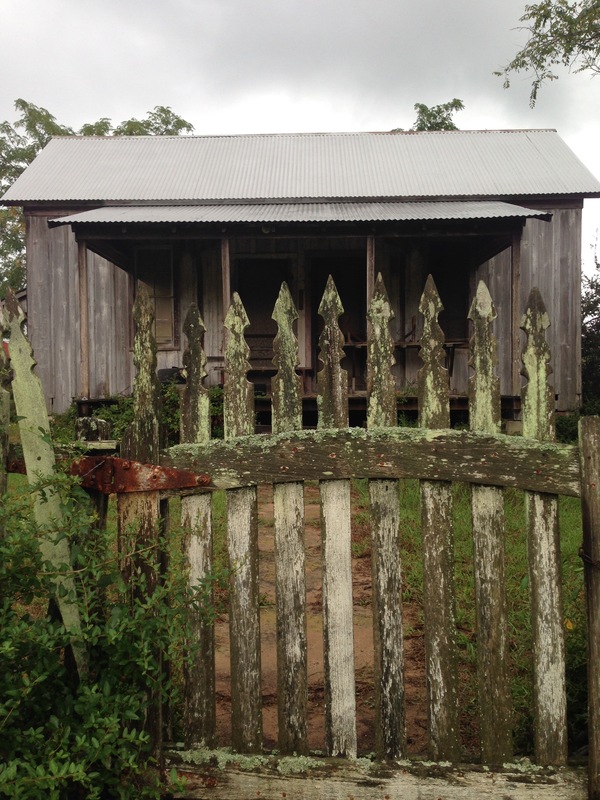 If you happen to come across one of these old homes, ask permission before stepping onto private property, take nothing but photographs, leave nothing but footprints, enjoy the experience, and respect the home and its history. The ghost town of Terlingua is located in the heart of the Chihuahuan Desert, one of the most rugged and hostile environments in Texas. The name of the town is derived from the Spanish words “tres lenguas” meaning “three tongues.” The discovery of quicksilver in the mid-1880s turned Terlingua from a sleepy little village into a town of a thousand-plus residents. By 1913, Terlingua had a dependable water supply, mail delivery, somewhat reliable telephone service, a hotel, and a physician. 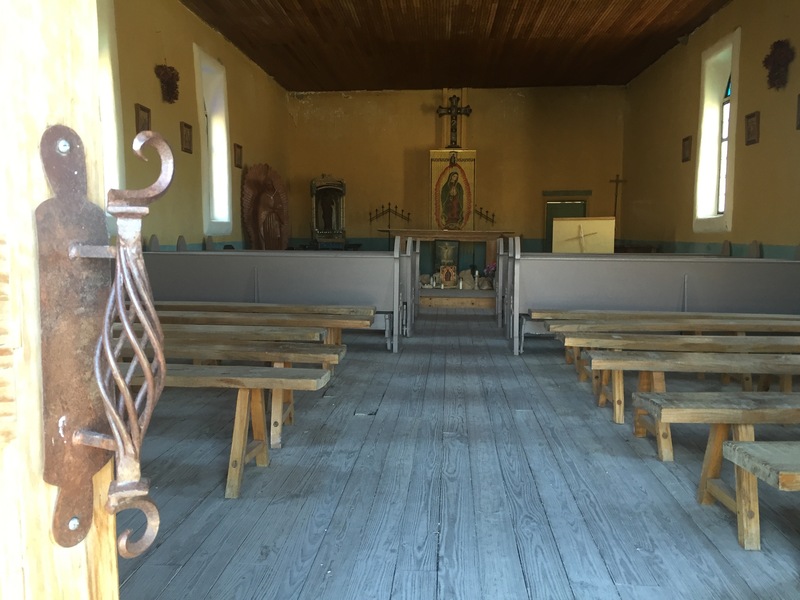 Sometime in 1914, St. Agnes Church, also known as Chisos Mission, was established and became the focal point of the mining town. Itinerant priests held services at the church once a month and also officiated at baptisms, weddings, and funerals. Church records indicate the priests adopted the Terlingua Cemetery. 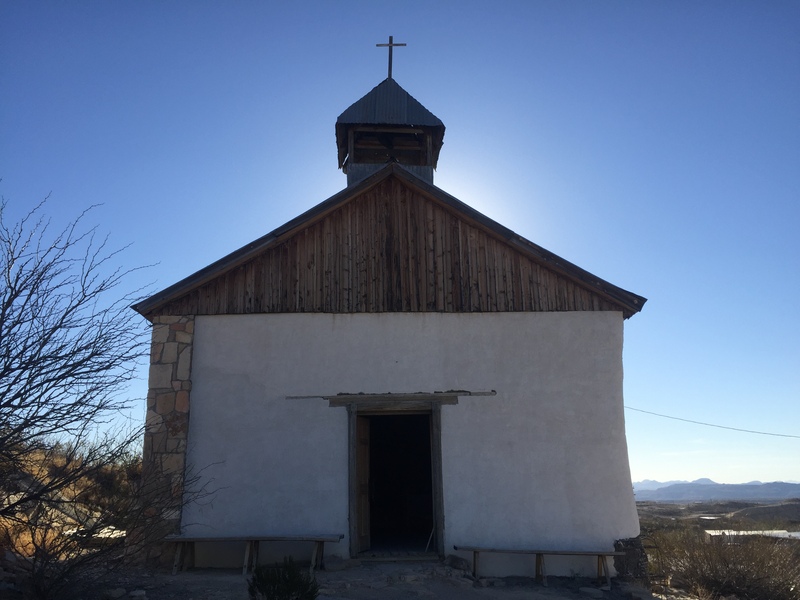 The burial ground is listed as St. Agnes Chisos Cemetery on church records but the official death records continued to list it as the Terlingua Cemetery. And although the town was segregated with Mexican families living east of the company store and Anglo families to the west, both Mexicans and Anglos were laid to rest in the same cemetery. The adobe building was constructed on a raised stone foundation on the side of a hill overlooking the town. 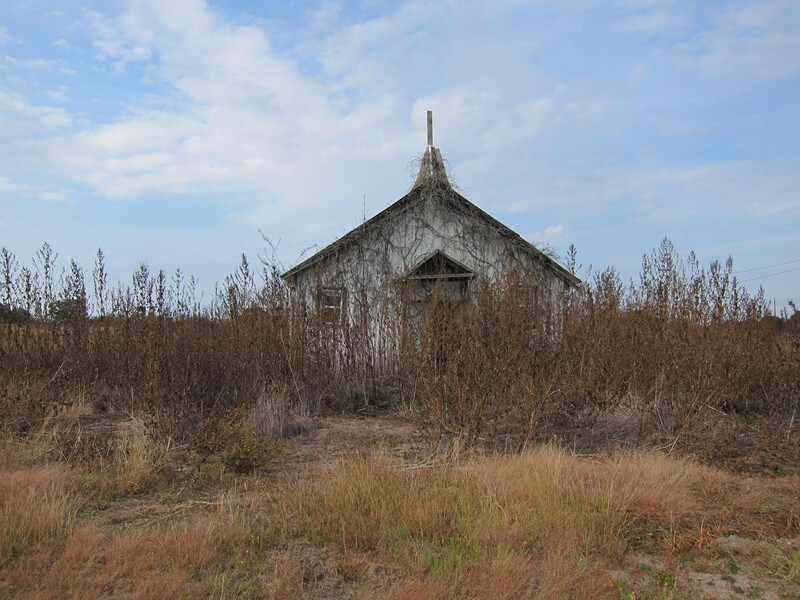 The building has survived the ravages of time and remains an iconic symbol of the importance of faith in this remote place. 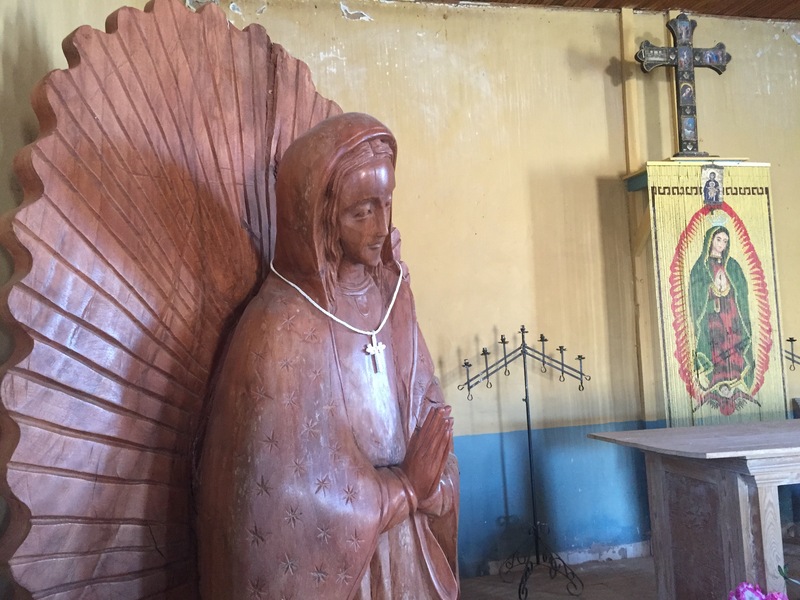 The interior is completely unpretentious — offering worshipers hard wooden benches, a weathered pine floor, painted adobe walls, and a simple altar. The spiritual comfort the faithful have received here, however, more than makes up for any lack of creature comforts. 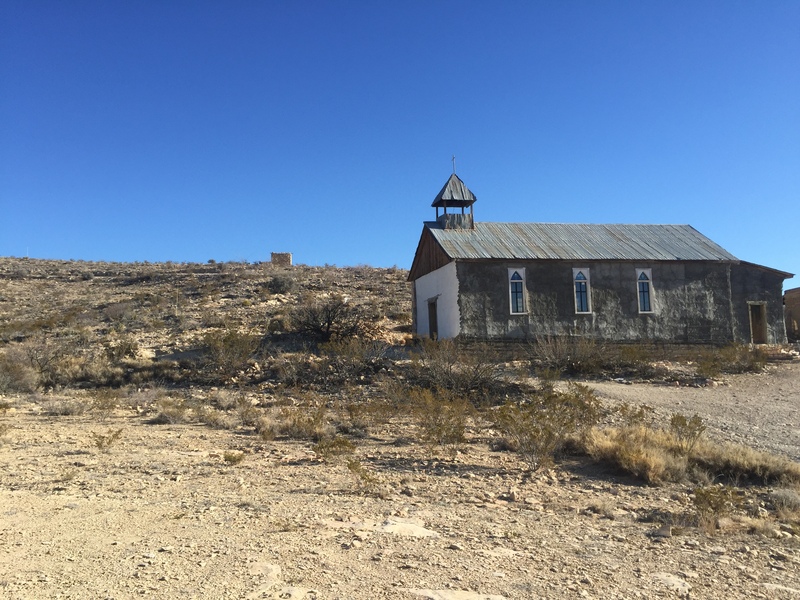 I hope to return to Terlingua to learn more about the old church and its history. Suffice it to say that St. Agnes Church has a beauty all its own. We’ll never know how many people over the years found solace, refuge, and the help they longed for inside the walls of this old church. St. Agnes Church remains as an enduring reminder that faith is important and can thrive in the harshest of places. The Painted Churches of Texas are high on my list of favorite road trip destinations. 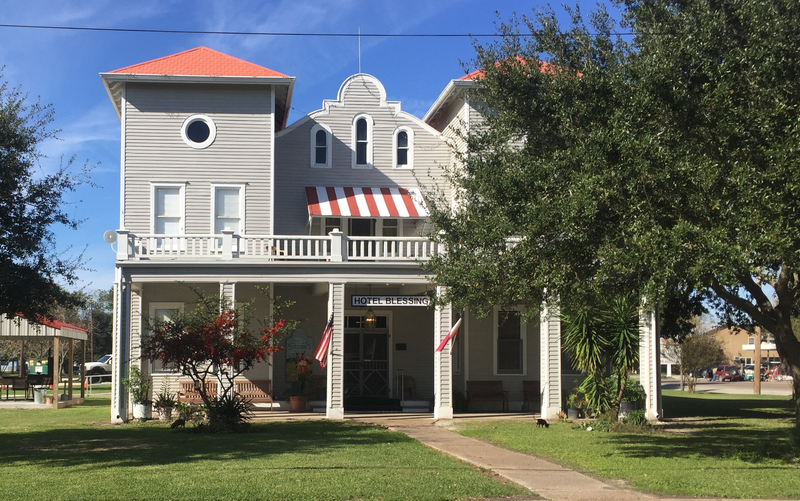 Several of the best examples of these historic structures are clustered in the vicinity of Schulenburg. These churches represent some of the very best examples of German and Czech architecture in the Lone Star State. They have survived because of the loving concern of their respective congregations. Every now and then I come across abandoned churches on my road trips — structures that are falling apart because they no longer have anyone to maintain them. One such structure is located along Highway 71 south of the tiny community of Altair. 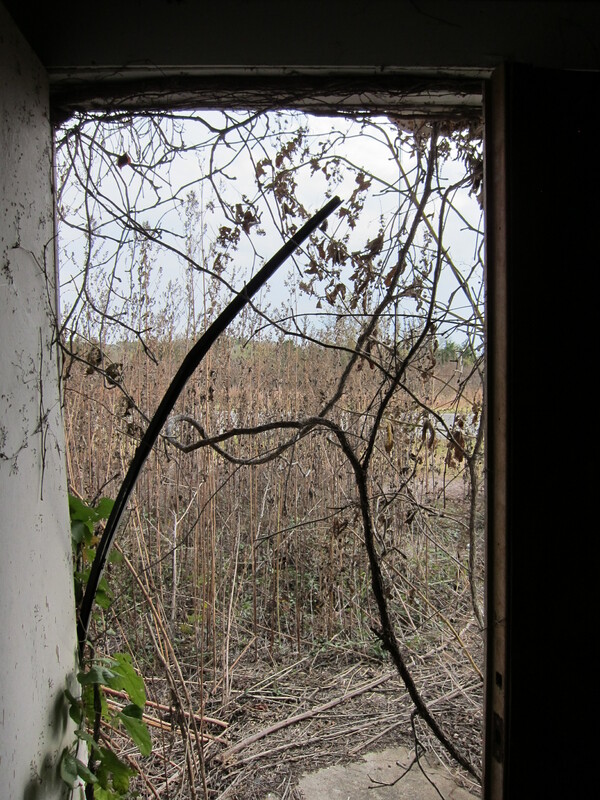 When I first drove past the old building with the wide-open doors, I had to turn around to check things out for myself. 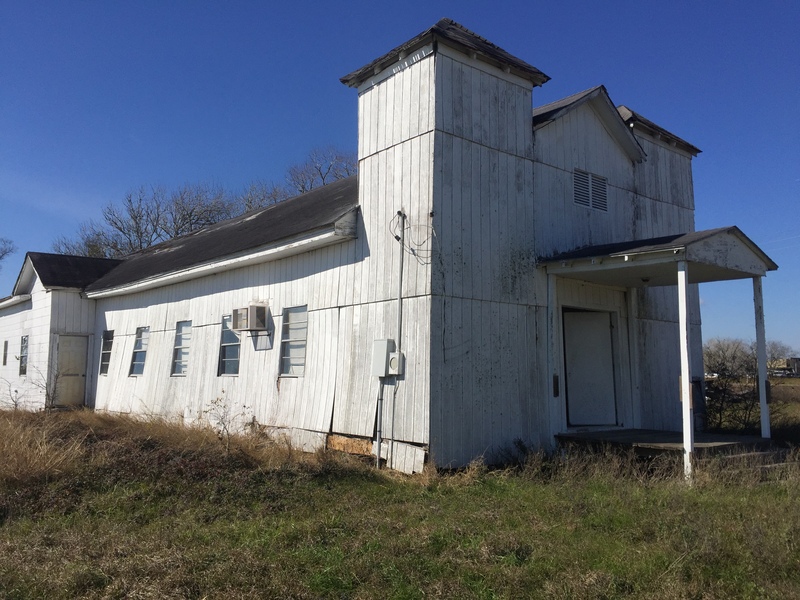 The first thing I noticed was the cornerstone, indicating that this now-abandoned building was once home to Southpoint Baptist Church. According to the cornerstone, Southpoint was organized in 1883, the same year that the University of Texas opened its doors in Austin for its inaugural session. Inside, the building was filled with jumbles of junk — odds and ends no longer of any use. 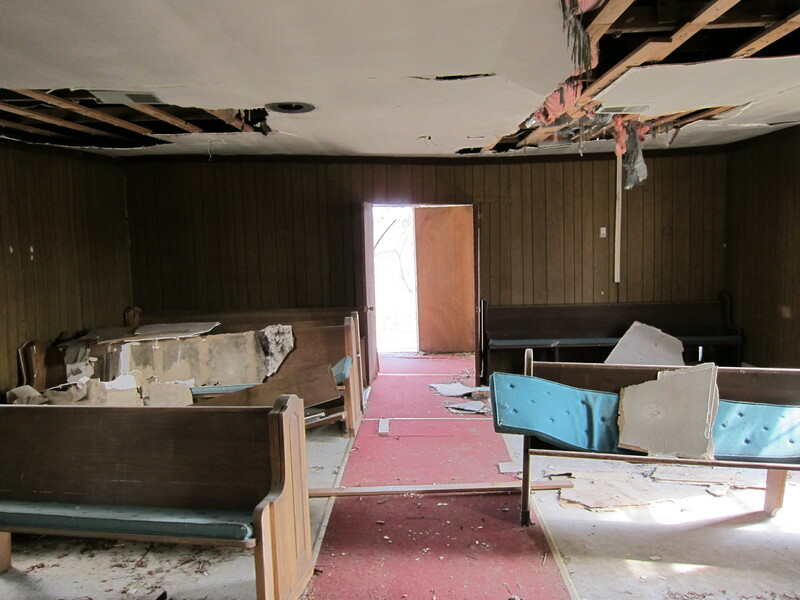 A few remaining seats, some preschool furniture in a side room, an old podium, and some Sunday School quarterlies scattered among the debris. The oldest quarterly I found was dated 1926 and the latest was dated 2010. You can’t walk into an old building like this without letting your imagination off its leash. Mine certainly ran wild in this old place. I wondered about the folks who put on their Sunday best and made their way to this location through the years — walking, on horseback, perhaps carriages, and later in automobiles. Looking toward the now-silent pulpit, I wondered about the sermons preached in this place. 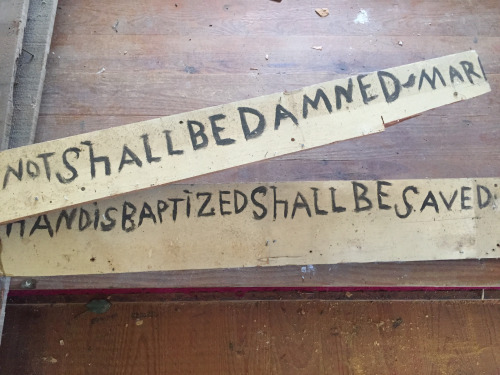 What had those who stood behind the pulpit shared to comfort the flock, especially during the dark days of two world wars? How much hope was dispensed here and who had left this place determined make the world a better place? 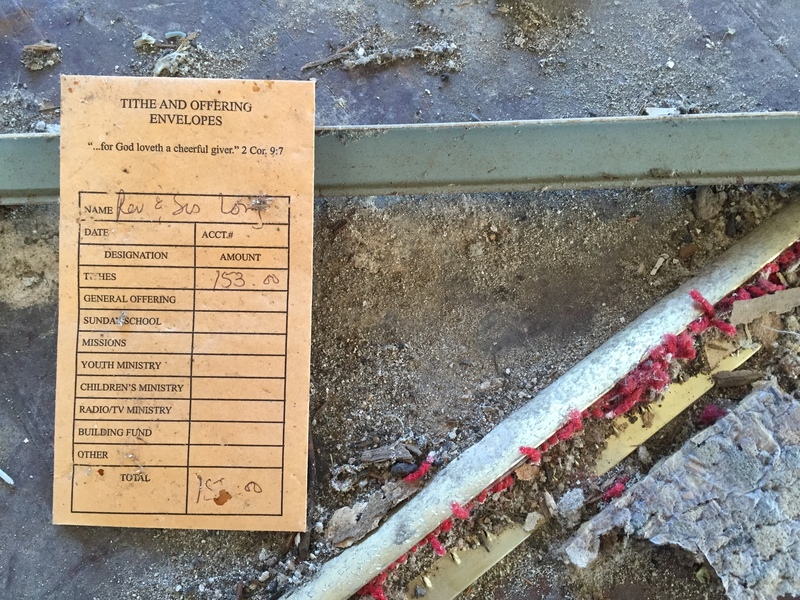 Just before I walked out the doors, I noticed an offering envelope among the decaying dandruff of this old building. The name of the giver was scrawled in cursive letters across the face of the envelope along with the amount he had given. Offerings like this are what kept the building in repair and likely met needs beyond the modest little corner lot on which the church is situated. The church building now sits empty and is slowly being reclaimed by moth and rust and decay. It is no longer a destination for worshipers, only a curiosity to those who travel down Highway 71. In reality, the only thing of value that remains is what the folks who worshiped here did to live out their faith in their community. I’m glad I pulled over to explore the old building. 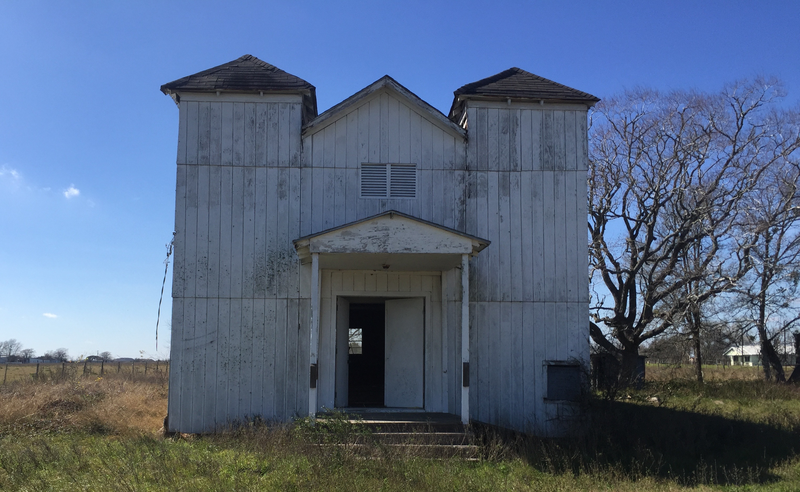 The clock has now stopped ticking on the life of this old church that survived more than a hundred years of Texas history. 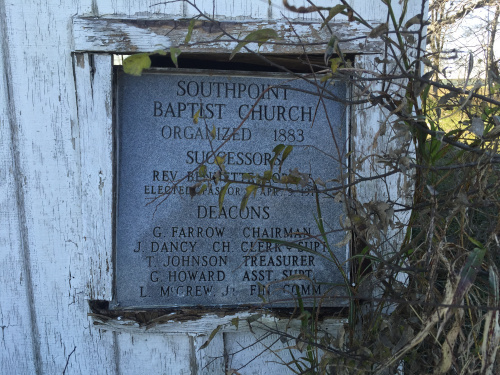 I hope that someone who attended took the time to record at least some of the history of this old church. I, for one, would love to know more about Southpoint — and other places like this tucked away on Texas back roads. 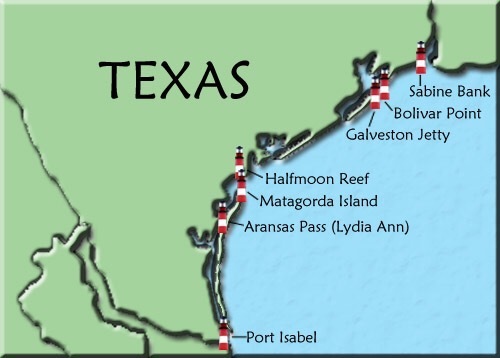 Of the sixteen lighthouses originally constructed along the Texas coast, seven lighthouses remain. 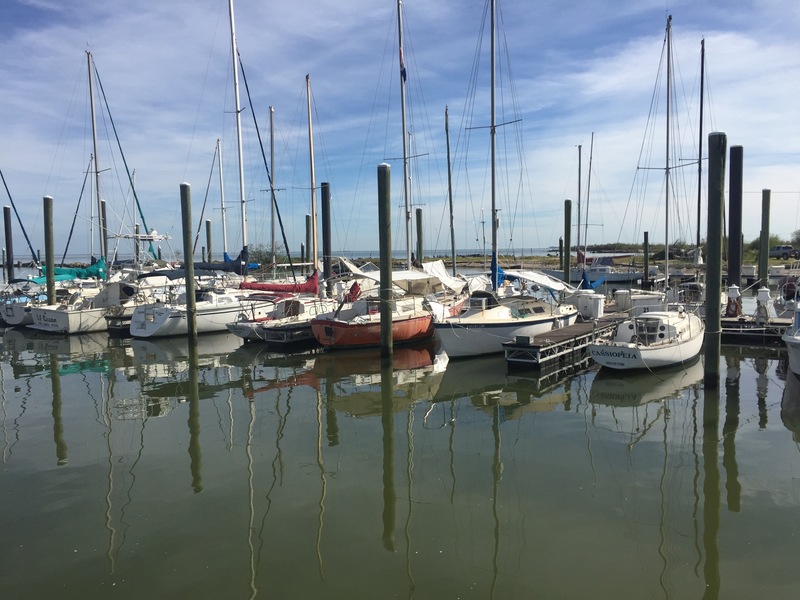 These guiding beacons are situated along the Gulf Coast from the southernmost tip of Texas to the mouth of the Sabine River along the Texas-Louisiana border. 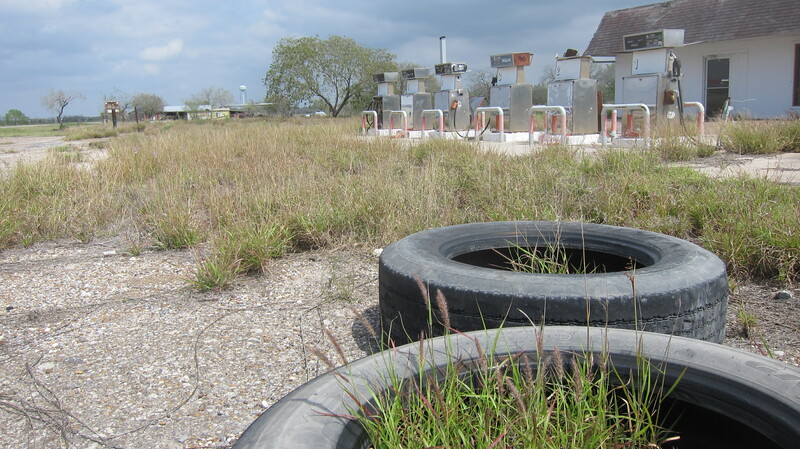 Some have been decommissioned and stand as silent sentinels along the Texas coast. Others still send their piercing light into the Gulf night. 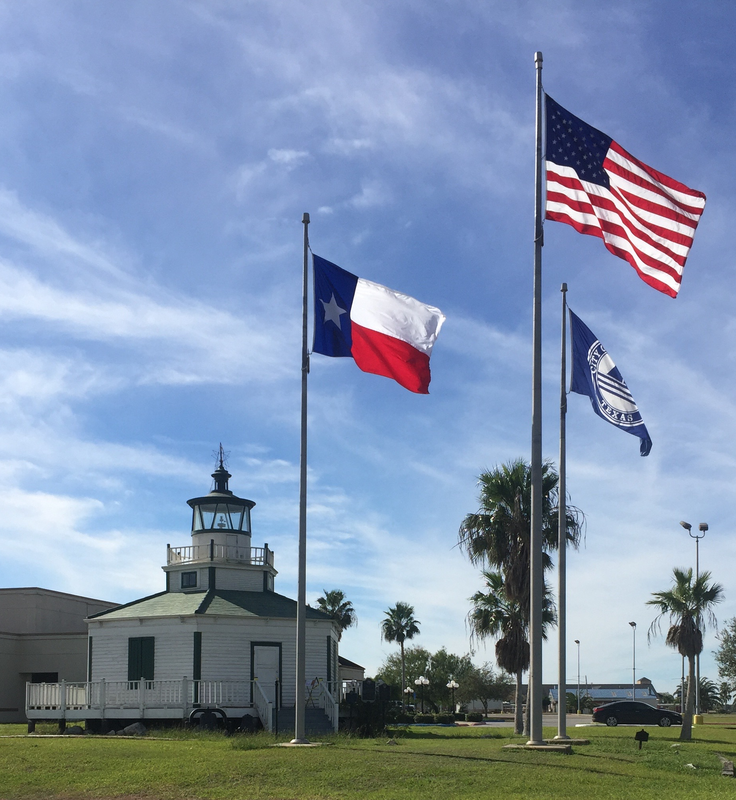 The Halfmoon Reef Lighthouse is the Lone Star State’s oldest surviving wooden lighthouse. Built in 1858, the hexagonal-shaped lighthouse played a key role in guiding ships into Matagorda Bay. For years, the Matagorda Island Lighthouse, built in 1852, guided ships safely into the bay. However, many large ships often ran aground on Halfmoon Reef, a shoal on the eastern side of the bay. So, the Halfmoon Reef Lighthouse was constructed and strategically situated on the southern tip of Halfmoon Reef to warn ships to avoid the jagged rocks hiding beneath the surface of the water. Surrounded by water, the Halfmoon Reef Lighthouse was an island unto itself. Twice in its history, a husband and wife shared the responsibility of manning the lighthouse. Stephen Hill, one of the lighthouse keepers, had a daughter named Sadie who was prone to sleepwalking. After her parents found her sleepwalking dangerously close to the edge of the lighthouse platform, they decided to take action to protect their daughter. The solution? They tied one end of a string to Sadie’s big toe at bedtime and other end to her sister’s big toe. Problem solved! The Halfmoon Reef Lighthouse survived the hurricanes of 1854, 1875, and 1886. However, the lighthouse was damaged by the hurricane of 1942 and was consequently decommissioned. The structure was moved from its watery perch to land owned by the late W.H. Bauer in Point Comfort. 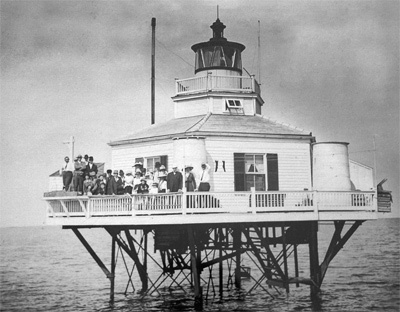 In 1978, Bauer donated the lighthouse to Calhoun County Historical Commission. 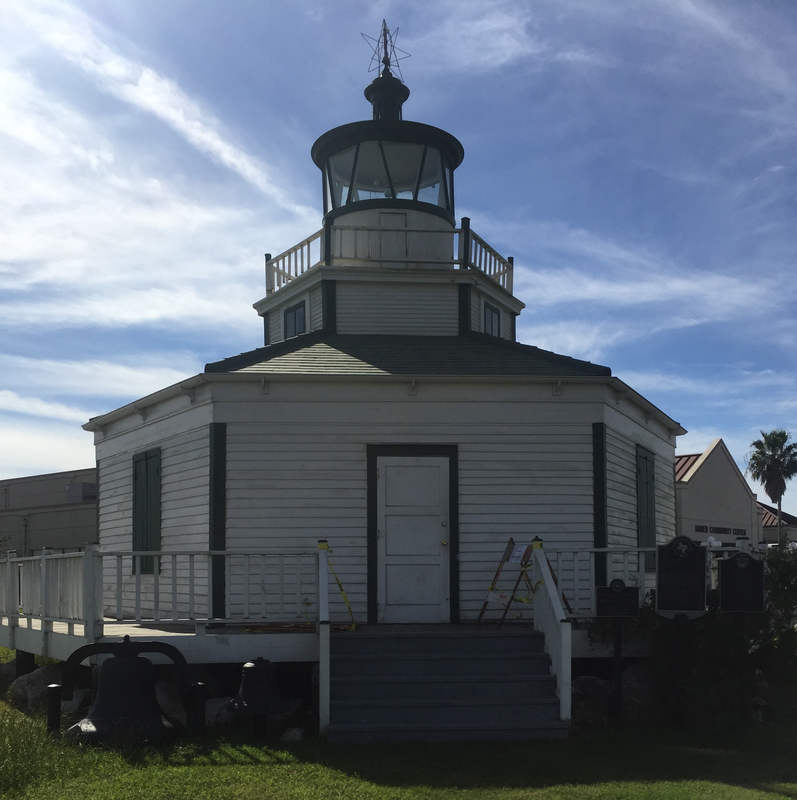 In the mid-1980s, the lighthouse was moved to its present location in Port Lavaca. Today, the Halfmoon Reef Lighthouse is regarded as the city’s most important landmark, welcoming travelers entering the city from the East on Highway 35. If you find yourself traveling down Highway 35, slow down and take a few minutes to visit the lighthouse and enjoy this little slice of Texas history. My road trip to the tiny town of Blessing was inspired by the name of the town. Blessing was established in 1903 on land owned by Jonathan Edwards Pierce, a namesake of Jonathan Edwards, the renowned 18th century preacher. When Pierce gave the right-of-way to the Galveston, Harrisburg, and San Antonio Railway, the settlement was as yet unnamed. Pierce proposed to name the settlement “Thank God.” However, when the Unites States Postal Service rejected his proposal, he named the place Blessing instead. 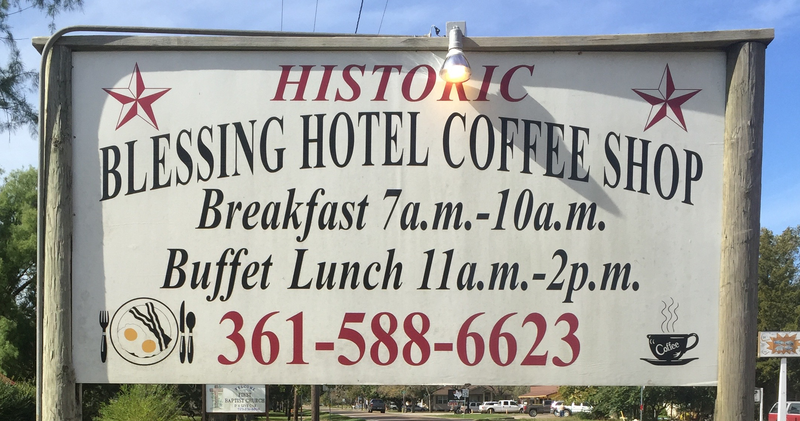 The best known spot in Blessing is the old Hotel Blessing, built in 1906. The hotel was built for land-seekers and was also a residence for developers Pierce and his son, Abel. Today, the hotel looks pretty much the same as when Pierce lived there and shipped his cattle to market on the nearby railroad. Hotel Blessing has survived the ravages of time, the battering of Gulf Coast storms, and retains its turn-of-the-twentieth-century charm. Once you step through the double entry doors it’s as though you have entered a time capsule. 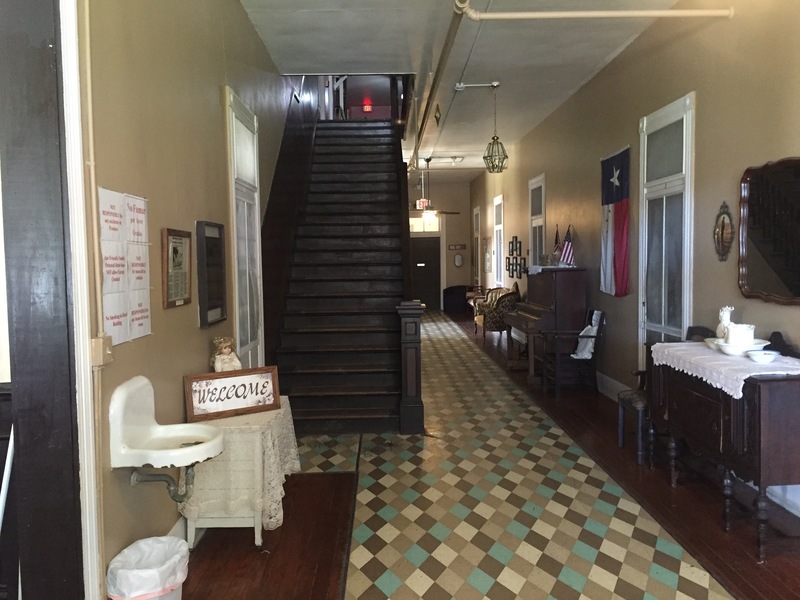 The long entry hall is accented with period antiques and other Texas memorabilia. A stairway on the left leads to the second floor. At the end of the hall is the entry to the Dining Room — the historic Hotel Blessing Coffee Shop. Of course, this is more than a coffee shop. 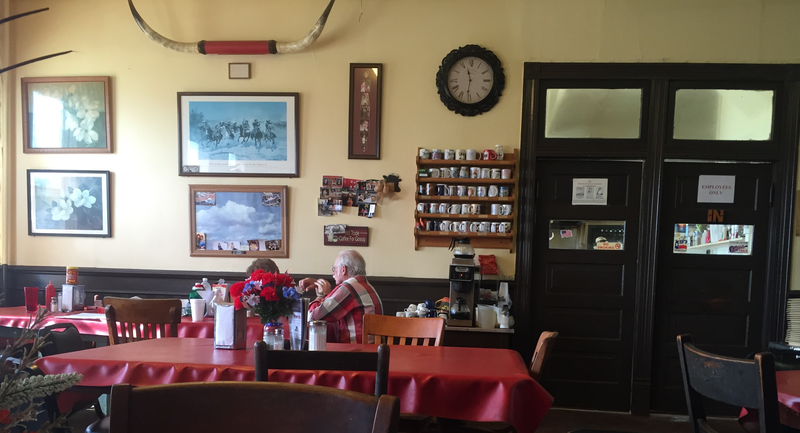 This cafe has been serving meals for more than a hundred years and is unquestionably one of the best places to eat in the Lone Star State. The cafe is a bit unorthodox, which is what makes it so special. My wife Cheryl and I were immediately greeted when we walked in. We were instructed to “grab a plate and help yourself to as much as you can eat — and sit anywhere you like.” The food is served buffet style on antique stoves at the back of the dining area boasting tables, chairs, and decor as old as the hotel itself. Crissy, one of the young ladies who works at the cafe told us the peach cobbler was especially good. “I made it myself,” she smiled. Cheryl and I loaded our plates with more food than you can legally eat a Baptist potluck fellowship. And it was all good. In fact, it was better than good. It was excellent. This was homestyle cooking at its best. Some have said that if you leave the cafe hungry then “it’s your own dang fault.” I agree. I ate more than I should have. And, Crissy was right. The peach cobbler was very good! 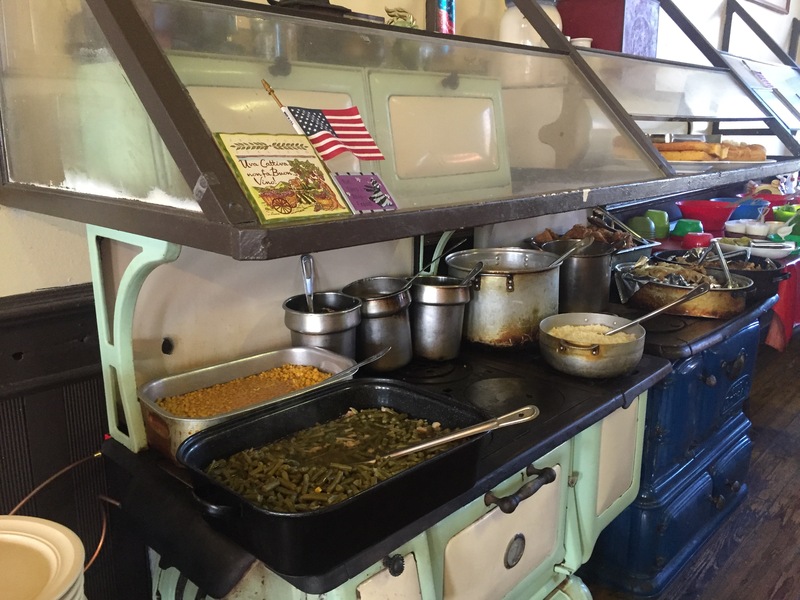 And the price for all of this homestyle goodness served in a place steeped in so much history — only ten bucks per person, including drink, dessert, and all the food you can possibly eat. That’s it. Ten bucks — tax included (pay with cash or check only). Not many places where you can get a deal like that these days and enjoy your meal in a laid back historical setting. There is no question about the fact that Cheryl and I will look for the next opportunity to hit the road to the cafe at Hotel Blessing. We think that maybe next time we will go there for breakfast. Crissy assured us that the pancakes are amazing. And she definitely knows what she’s talking about! There is something about old and abandoned buildings that stirs my imagination and ignites my curiosity. Whenever I venture down Texas backroads, I always look for old houses and buildings — the ones that have been long abandoned and are slowly being reclaimed by the elements. One structure in particular beckoned me to pull off the road just outside of Muldoon, a tiny community with a population of a little more than a hundred residents. It was an old church building with only the vertical section of a cross remaining on the steeple. 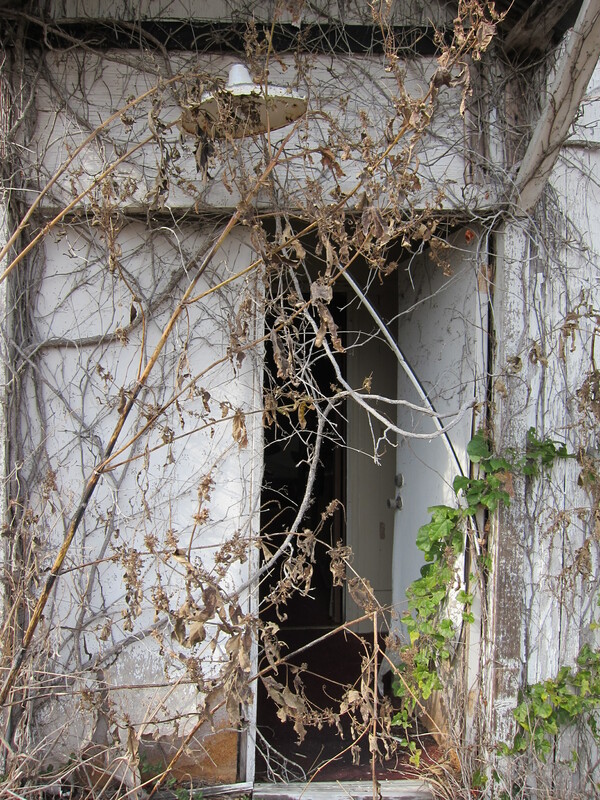 As I made my way through the dry overgrowth, I noticed that the front door of the building was open. I grew up in a small town in the days when church buildings remained open all day and, in some cases, all night. 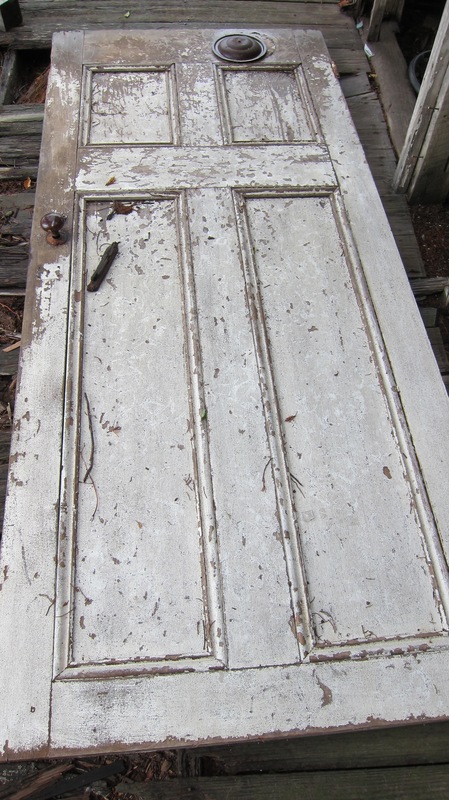 In fact, I never recall the door to my childhood home ever being locked when I was growing up. In all of the years I lived at home I never had a house key. 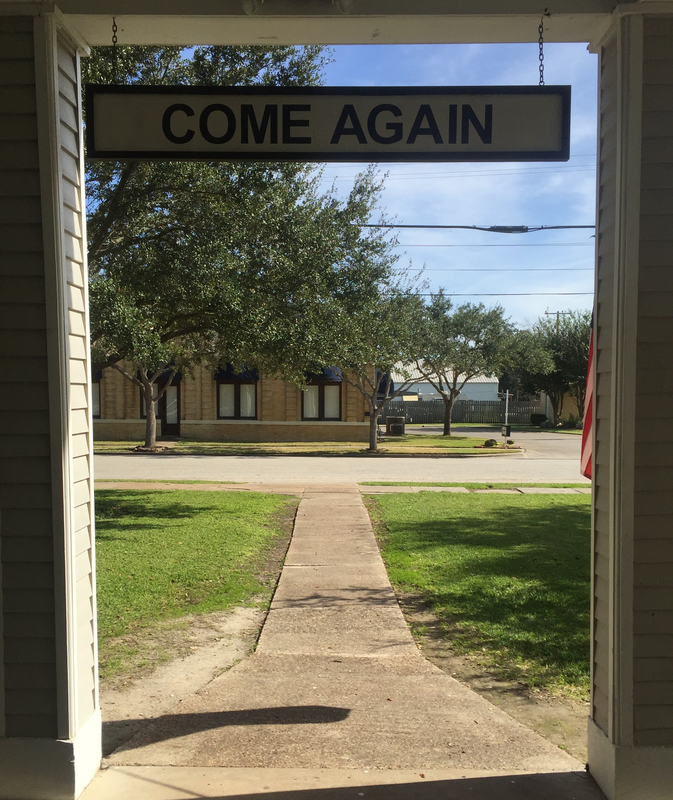 At any rate, I was glad to find an open door when I approached the old church building. 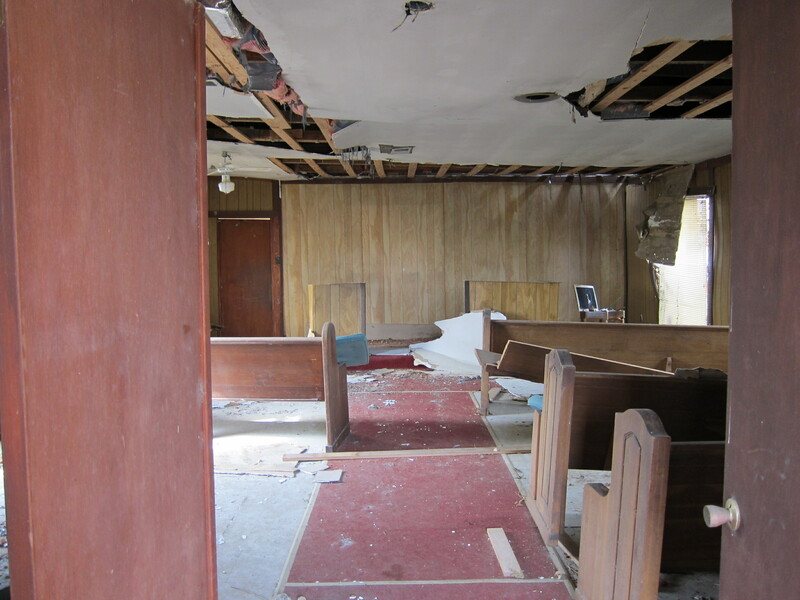 Once inside the building, I noticed the few remaining pews on either side of the red-carpeted aisle. Everything in the building was covered with the dandruff of decay. I paused for a moment and tried to imagine what things must have looked like when the building was new and wondered how many brides had walked down the short distance to the altar. I had to remind myself that this old building was not the church, only the building where the church had once met for a season. The signs that this had once been a place where people studied the Scriptures were evident. 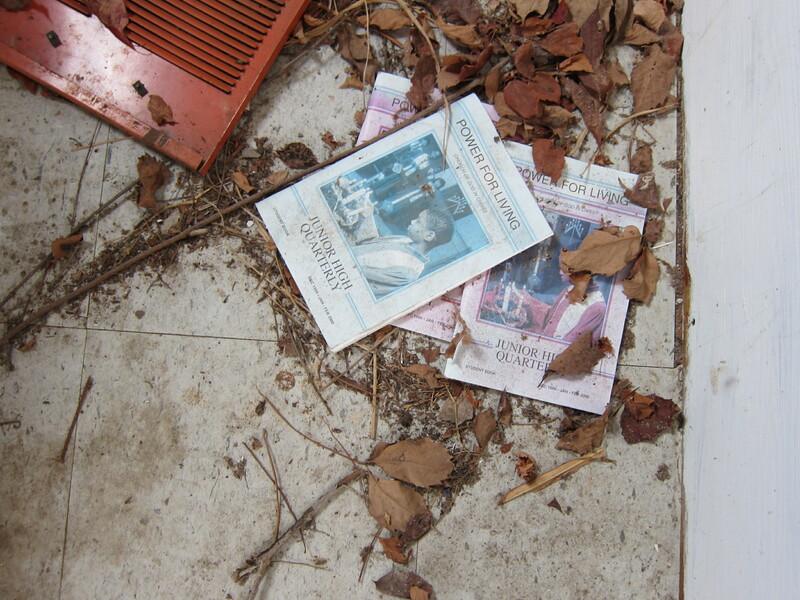 Old Sunday School quarterlies littered the floor, some with the fading names of the members written on the covers. 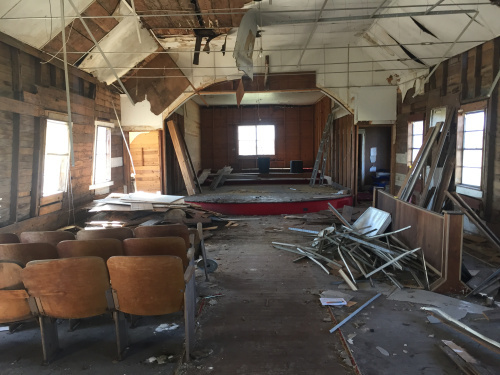 Once again, I could not help but wonder about those who had studied those lessons and perhaps made some life-changing decisions in this old country church building. In a way it did not matter so much that these old lesson books were strewn on the floor because what really matters is what the folks who studied here carried away in their hearts. Standing in the pulpit and looking toward the pews, I wondered about those who had stood in that same spot over the years. How many sermons and weddings and funerals had taken place there? What about special seasonal observances or musical presentations? The history of what happened in that building is lost to all but those who worshiped there. But, without question, so much must have happened in this humble little building throughout the years. After lingering for a while I made my way slowly down the aisle toward the exit. Once again the open door beckoned me out toward the world at large, the place where we are to live out our faith. And again I wondered about how many people might have left this place a little different than when they walked in, perhaps more determined to love God and love people. That’s really the way we should always leave our places of worship — changed for the better, a little more in love with God, and ready and willing to serve others. 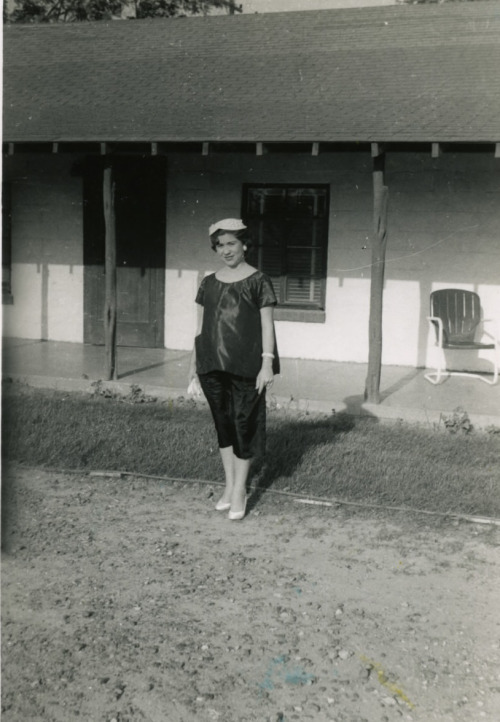 The first home I lived in when I was growing up in South Texas had a porch that spanned the length of our home. 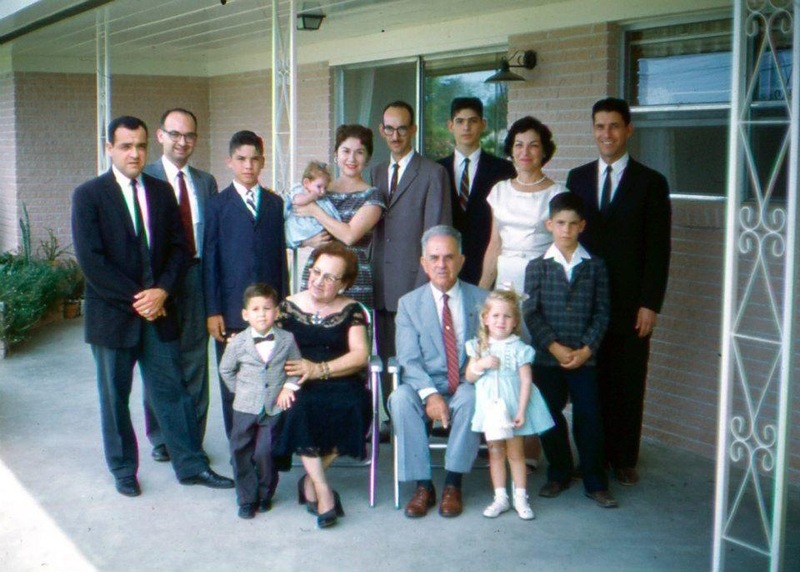 And when my grandparents built their new home, they included spacious porches on both the front and back sides of the house, each suited for different parts of the day. I have more memories than I can count of sitting on the front and back porches with my grandparents. I learned a lot about a lot of things from them on those porches. 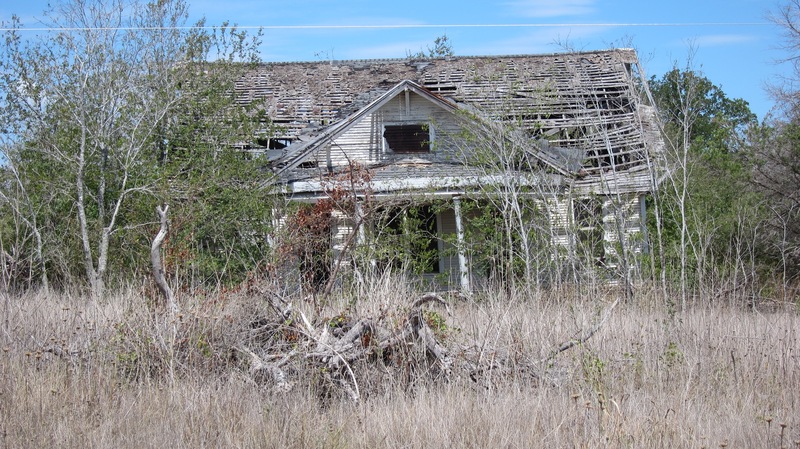 I love exploring old abandoned houses on Texas backroads. 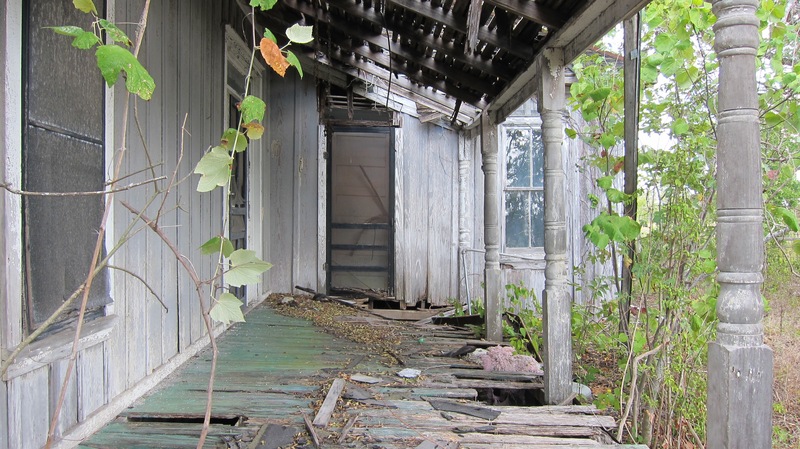 A common feature of many of these old homes is the front porch. Whenever I see one of these homes, it’s not hard for me to imagine what life must have been like for those who lived there — hard-working folks chatting at the end of long days, watching the sun set from their front porches. I think that we lost something special when we abandoned our front porches and opted to do all of life inside of our comfortable homes. The conversation and interaction of years gone by has been replaced by high-definition television and smart phones. These devises easily distract us from the people who share the same living space with us. Please understand that I am not anti television and telephone. It’s just that reflecting on the role that the front porch once played in my life makes me wonder about what I have given up in exchange for these devices. Or maybe it’s just that I am becoming more nostalgic the older I get. I do however, believe that we need to somehow recapture the essence of front porch living as modern families. Perhaps that means turning off the stuff more often and actually conversing with others, the old-fashioned way of doing face time! I am grateful for the years I spent with my grandparents on their front porch. When I close my eyes I can hear their voices, smell the cool grass, feel the summer breeze, and envision the beautiful Texas night sky. It didn’t matter that we didn’t have air-conditioning in those days or that there was not much to watch on television. We had something far better — a meaningful connection with one another because of the time we spent together on the front porch.